Perfect for the Season starting this weekend, this Spicy Avocado Ranch & Bacon Dip will have the football fans in your house yelling touchdown! 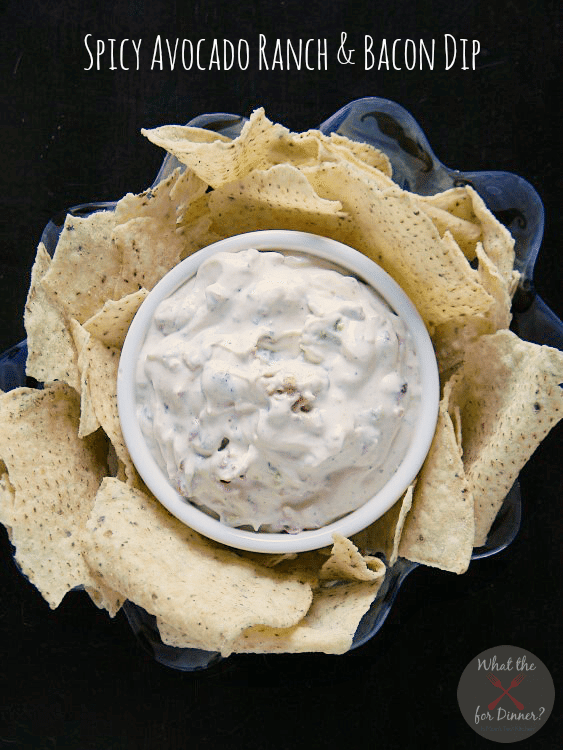 This dip has a little kick to it with fan favorites of ranch. Plus, how can you possibly go wrong with a dip that has BACON in it. It should be a prerequisite that all dips include bacon. Right?! My husband and I both love spicy and avocado, this sounds like a great combination and perfect for all the football we will be watching now that the season has started. I would love it if you could come by and share this fabulous recipe at Foodie Fridays. The party starts Thursday evening at 9 pm EST. I know everyone would love it! Seriously Jenny you are killing me with all this yumminess. I want to have a football party so I can make those dips (and I really don’t like football all that much)! Thanks and pinning now!